Further progress on using four bar linkages to drive wings. I've tried a variety of different geometries, finally settling on this layout. The dimensions of the bars are shown in the final image. Having decided on a wing geometry I've opted to drive the wings using a crank slider mechanism. Rather than re-inventing the wheel my first prototype is made using the simple crank slider project which can be downloaded here. The only thing that I changed was to increase the throw of the crank slightly. 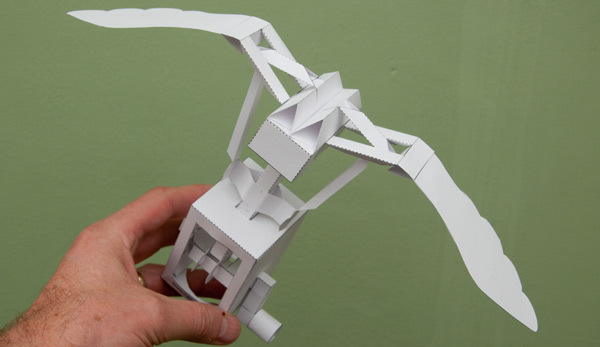 The wings are driven by push rods connected between the slider tube on the box top and the centre linkage on the wing. The four bars of the wing linkages are clear in a front view. the wings look great the movement is amazing on them and they would work great for any model that had wings on it. Mr Da-Vinci would be proud! I know the Flying Pig days are long gone. But perhaps a reprise just for these magnificent wings? Also – do I need to start some kind of petition to bring Card Bawdy back? [giggle] I really would love that. Best wishes, and thanks for all the fun! "But if it's a bat the artist wants, then a bat he shall have. ^__^"
I am afraid if a bat is given these wings, it will actually fly! Awesome! 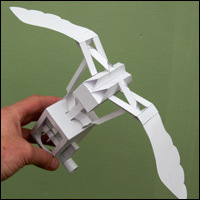 I thought it could be a mixer of Leonardo Da Vinci Ornitopter plus a Providence Traveler (see the links below). It would be nice to create a new model. Yes, it would make a great bat. But there already is a great bat out there for us. And a fish is…well a little prosaic it seems to me. But now a cow! A flying cow (that just jumped over the moon? ), how neat that would be. Of course, there are angels to consider,too and flying monkeys…it isn't Kansas anymore is it? If not bat then how about a witch on a broomstick? But I still like the bat idea regardless. Ok, now we need help from Rob. Rob, what are you thinking? I would have thought that a pig would be the natural choice. But if you are determined to have something different then what if you have something that slips over the blank shape with costumes of different kinds of animals: wolf, sheep, cow, pig, etc.